Who doesn't love a hefty slice of carrot cake as a delicious Easter dessert or pick-me-up? If baking a whole cake is too much, give this cookie recipe inspired by the classic confection a go. It's quick and easy to do and one batch makes 20 individual treats. The cookies are soft on the inside, with a surprisingly crunchy exterior. 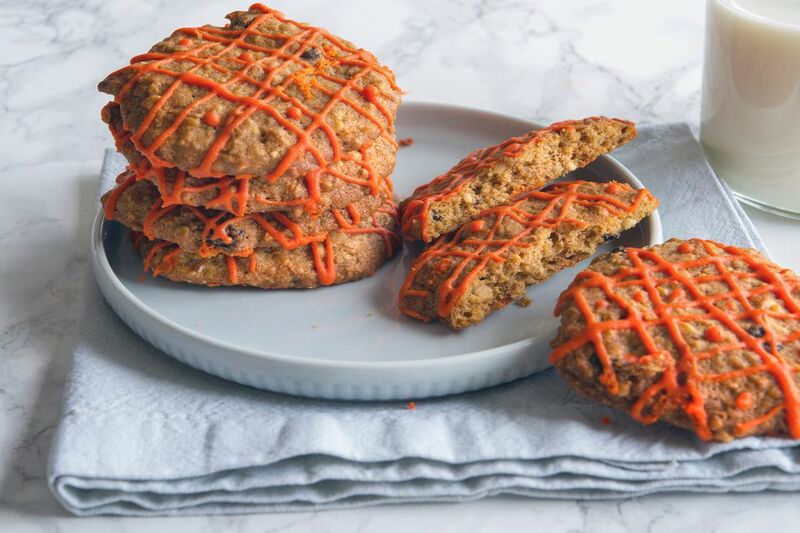 Thanks to the addition of super healthy oats and walnuts, plus fresh carrot and lots of warming spices like ginger, cloves, and nutmeg, this could quickly become a family favorite. Do not be daunted by the number of ingredients here—all you need to do is simply take some time to weigh and measure them before you begin. The rest is easy. Place the flour and baking soda in a large baking bowl. Add all the spices and salt. Whisk lightly with a whisk and put to one side. Beat the butter and two sugars together. You can use a hand whisk, but a stand or electric hand mixer makes the job easier and faster. Continue whisking until the butter and sugars are light and fluffy. Beat the egg and vanilla extract together with a fork. With the mixer still running beat into the butter mixture a few drops at a time; do not add the egg all at once or the mixture will curdle. Scrape the sides of the bowl from time to time to make sure all the butter and sugars are combined properly. Drop the speed of the mixer to low and stir in the flour and spice mixture a few tablespoons at a time. Do not try to rush this process; the careful stirring makes sure your cookies will be light and airy. Stir the grated carrots, walnuts, and oats into the cookie mixture. Slowly stir in the dried mixed fruits. Remove the bowl from the mixer and put into the refrigerator for 10 minutes to chill the mixture slightly. Heat the oven to 375 F. Line a heavy baking tray with parchment paper. Remove the bowl from the fridge and take 1 large tablespoon of the mixture and roll slightly. Place onto the baking sheet a couple of inches apart. The cookies will not spread too much but do need some room around them. Gently press the mixture to flatten the cookie. Continue to fill the tray, then bake in the middle of a preheated oven for 12 to 14 minutes, or until the cookies are golden brown. They will still feel a little soft to the touch, but will firm up when cooled. Remove from the oven. Leave the cookies on the tray for 5 minutes, then transfer to a cooling rack. Repeat until all the mixture is used up. Whisk the cream cheese, butter, and vanilla extract together. Add the food coloring and whisk again. If the frosting is not orange enough, add a tiny bit more until you reach the color you want. Decorate the cookies as you wish either using a piping bag or swirl a little frosting on top with a spoon. The cookies will keep for a two to three days if stored in an airtight tin or box. The cookies also freeze exceptionally well with or without the frosting. Lay the cookies on a tray and freeze, then pop into a freezer bag or box and return to the freezer. Store for up to two months. When ready to eat, defrost in the refrigerator. Want to add even more goodness to these delightful cookies? Then switch out half of the oats for crushed barley flakes. The barley adds extra fiber, texture, and flavor.